Building portfolio management and performance benchmark. Buildings energy use is determined by multiple factors and variables, and are notoriously compicated to track in a meaningful and comparible manner. Energy services providers and facility managers need to process through disparate time series of energy bills, normalize them to calendar months, neutralize the effect of weather, occupancy, working hours and other variables to create reliable performance metrics. In addition, understanding energy use by end-use category requires complex algorithms to disaggregate the loads. 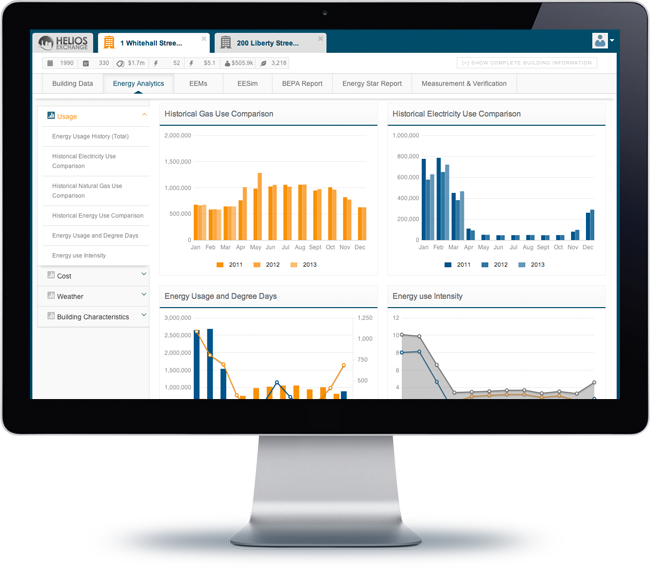 HELiOS Energy Analytics simplify the process and provide standardized energy performance metrics to easily track usage, prices, costs and energy savings.